On my Christmas list this year are the two darling daughters, ages 8 and 2, of dear friends of mine. It would certainly be easy to buy something for them at the wonderful local toy store around the corner from me, but it’s been awhile since I’ve made anything for these kiddos so I’m thinking something handmade would be nicer. 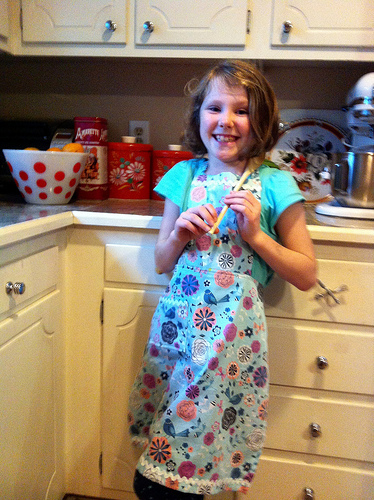 Their mama loves to cook and bake, and I’m imagining a lot of cookie baking projects while the girls are home from school for winter break, so I decided to make up a ric-rac trimmed child-sized baking apron for the 8-year old girl this weekend. For this project, I used my own almost-8-year-old daughter as a model to determine sizing. 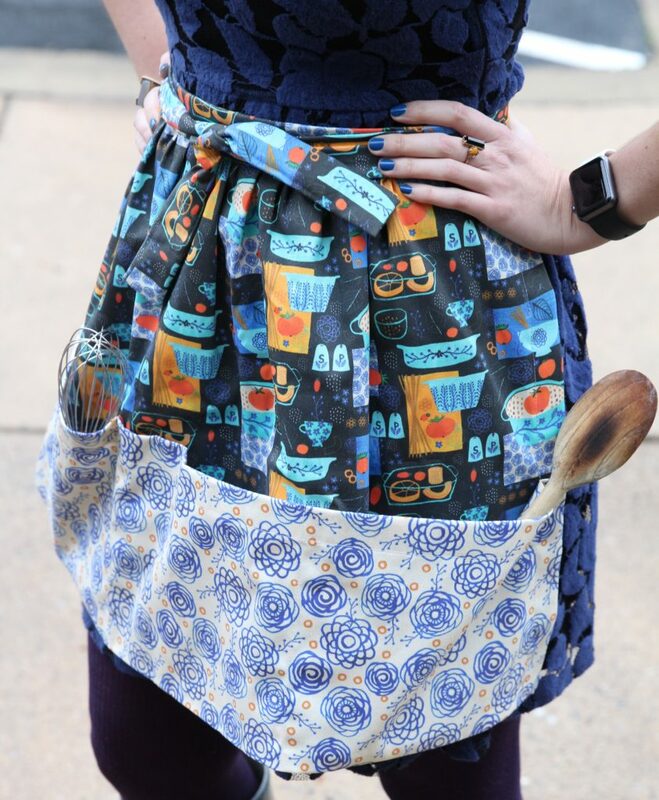 She’s about average weight and on the tall side so I think this apron should fit most 8-year old children, especially since the ties offer some flexibility as the child grows. 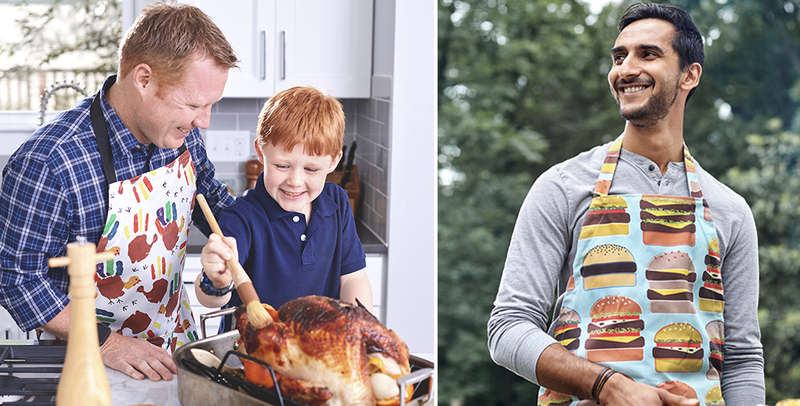 And I’m sure I don’t need to point this out to most of you, but boys like to cook and bake, too! 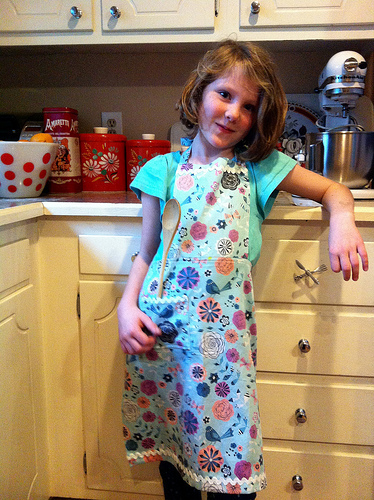 Don’t forget the boy-who-would-be-chef in your life, too, as you consider this kid’s apron project. 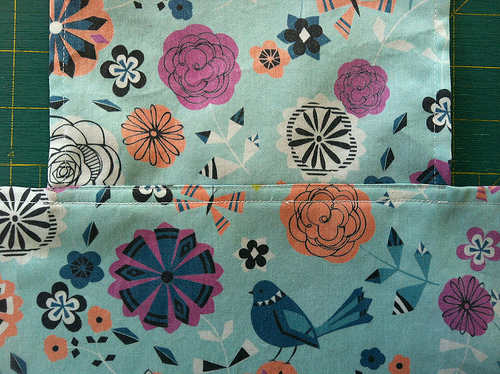 I used a yard of Spoonflower organic cotton sateen printed with Sonny&Bee’s “Summer time” design. I love the slight sheen and softness of our sateen but our basic combed cotton or Kona cotton would also work well. Wash and press your fabric before cutting. 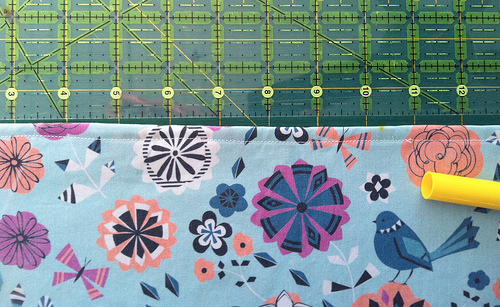 Note: If you’re using a directional print that has a right side up, pay attention now to how you cut your fabric so that you don’t end up with upside-down birds or writing or what-have-you. Press in the short sides of all four ties by a scant quarter-inch. 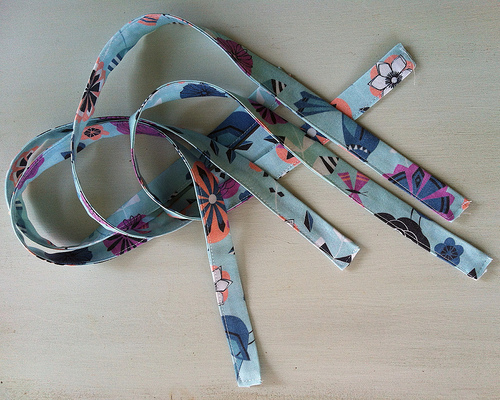 Then press up the long edges of all four ties a scant quarter inch. With wrong sides together and matching up the pressed edges, fold each tie in half lenghtwise and press to enclose all raw edges and create 3/4-inch wide ties. Now begin edgestitching the ties. 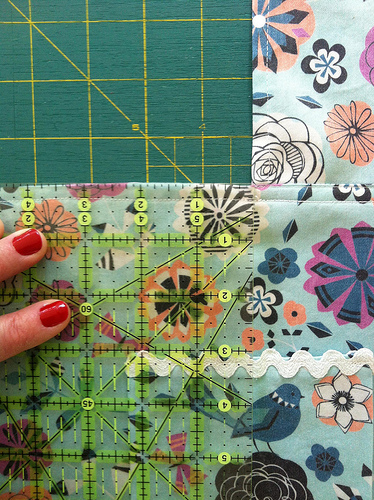 Start from one short end, pivot at the corner, and stitch the long edge. 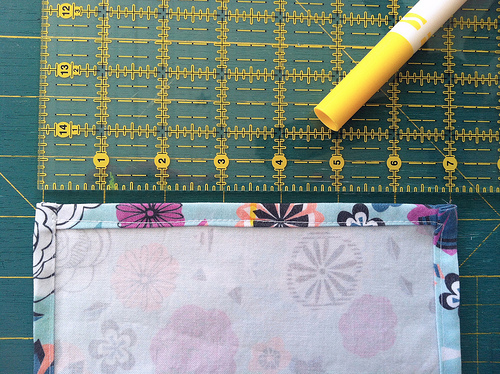 Pivot again at the other corner, sttich the second short edge, and anchor your stitching. Repeat with the remaining three ties. Set those aside for now. Stitch across the top and bottom edges about one-eight inch from the pressed edge. Leave the side edges unstitched for now. Press the top and bottom edges of the pocket in a scant quarter-inch, then fold those edges over another scant quarter-inch to enclose them. Press. Repeat with the two side edges. If you’d like to use trim on your pocket, apply it now. (I’m a fan of trim on pockets because it makes it easier to locate them quickly.) I used medium white irridescent ric-rac because this particular little girl enjoys a little sparkle. Set the pocket aside. Press up the bottom edge of the bib a scant quarter-inch, then fold that edge over into another scant quarter-inch to enclose it. Press. Next, fold down the top edge down a scant quarter-inch, then press that edge down into a one-inch hem. 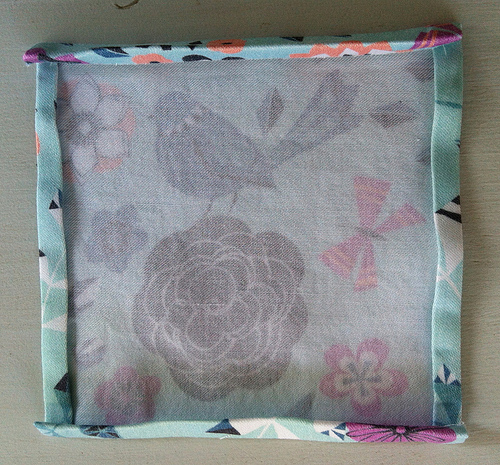 Now fold the two side edges of the bib in a scant quarter-inch. Fold those side edges in another scant quarter-inch to enclose them. Press. Stitch down one side of the bib, then along the bottom, then up the second side, pivoting at the corners and keeping your stitching line about one-eight inch from the pressed edge. Finally, stitch down the deeper top hem about one-eighth inch from the pressed edge. 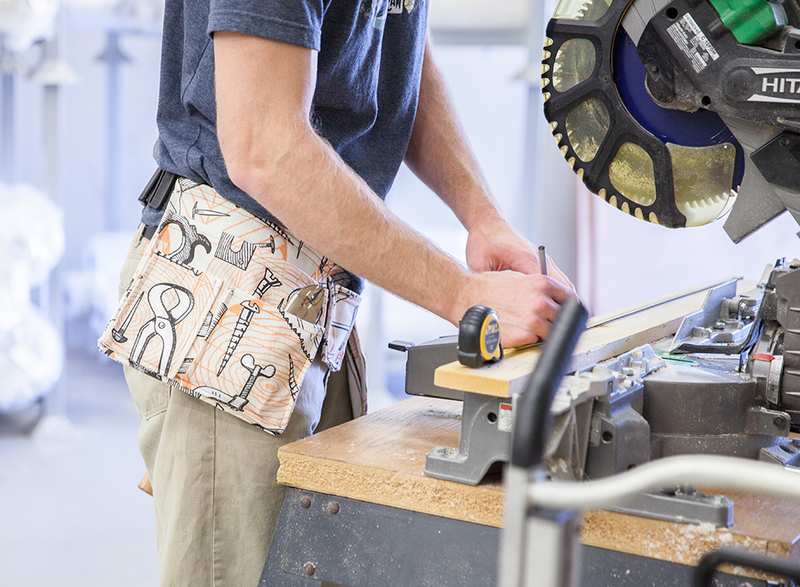 If you’re using trim on the apron bib, you should add it now. More ric-rac is good! Yep, there are more edges to finish but we’re almost down with that now. 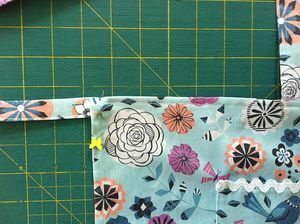 Fold down the top edge of the apron skirt a scant quarter-inch, then fold again another quarter-inch to enclose the raw edge. Press. Fold up the bottom hem a scant quarter-inch, then press up a deeper one-inch hem. Press. Finally, fold the side edges in a scant quarter-inch, then fold again another quarter-inch to enclose those edges. Press. 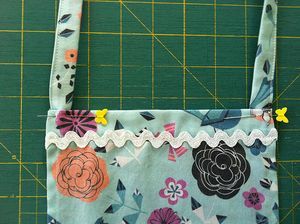 Stitch up one side of the apron skirt, then across the top of the skirt, then down the other side, pivoting at the corners and keeping your stitching line about one-eighth inch from the pressed edge. 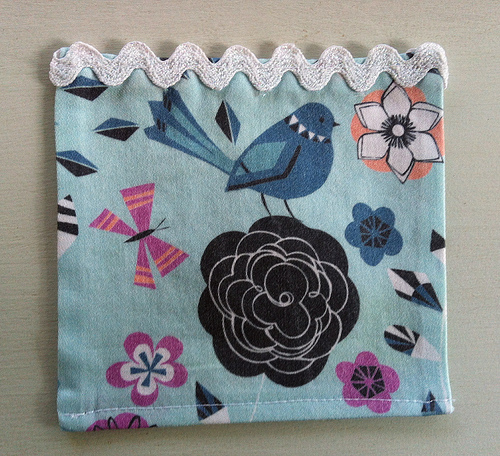 Stitch across the bottom hem at the folded edge about one-eighth inch from the pressed edge. If you want to add some more trim at the bottom hem of the skirt, now is a good time to do it. Phew, all those edges are finished now and it’s time to put it all together! Do the same with the apron bib, but measure and mark the center point along the bottom edge of the bib. My bib measured 7 inches wide, so I put a mark at 3-1/2 inches. Overlap the top edge of the apron skirt over the bottom edge of the apron bib about a quarter-inch, aligning the center points and making sure that the finished top edge of the skirt is lined up with the line of stitching at the bottom of the apron bib. Pin in place. Edgestitch the skirt to the apron bib, lining up this new line of stitching with the line of stitching on the apron bib. Stitch a second line over the line of stitches visible on the apron skirt and about a quarter-inch below the line of stitches you just put in. You should be catching the bottom hem of the bib under this second line of stitches. Using two lines of stitching will attach the bib to the skirt a little more securely and will also prevent the apron’s bottom hem from curling up as it’s washed. 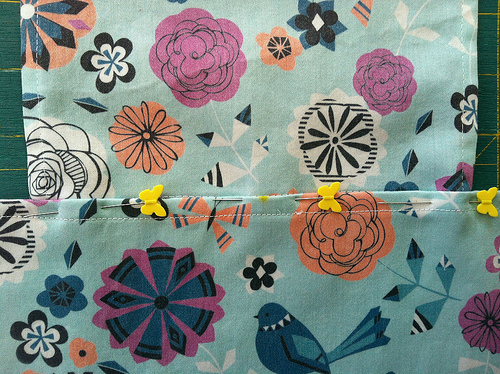 Find the center of the finished pocket at the top edge and mark it with a pin. My pocket center was at 2-1/4 inches. 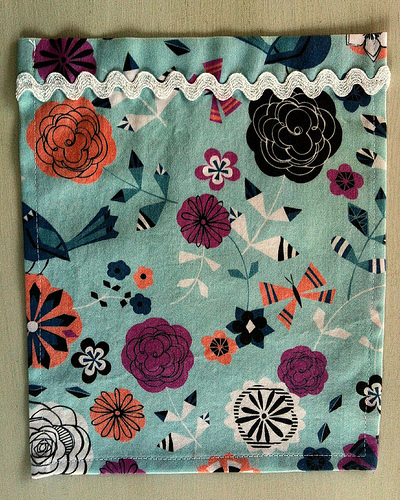 Lay the apron flat in front of you with the print side up and measure a point three inches down from the left corner where the apron bib meets the skirt. Align the pocket center to that point as shown here. 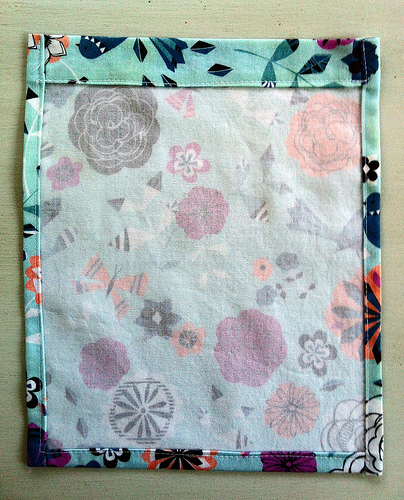 Pin the pocket in place along its side and bottom edges. Edgestitch the pocket to the skirt down one side, across the bottom of the pocket (on top of the existing line of stitches), and then up the other side of the pocket. Don’t forget to leave the pocket’s top edge free! Pin the apron ties in place at each top corner of the bib and at the top edges of the apron skirt, about one quarter-inch in from the finished edges of the apron. Be sure to run the waist ties out from the apron skirt and the neck ties up from the bib top as shown in the photos below. Once you’ve stitched on the apron ties, you’re all done. 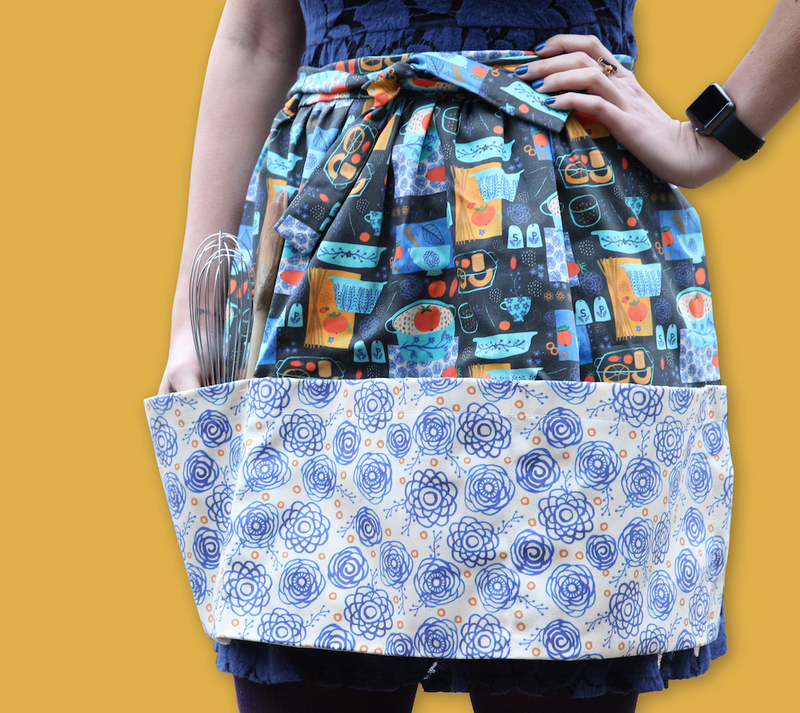 I hope your apron sees many happy, cozy hours in the kitchen!